Directions: Saturate a cotton round, then gently sweep over face and eyes to remove makeup and impurities. No need to rinse. Ingredients: Water, Cyclopentasiloxane, Glycerin, Glycereth-7 Triacetate, Propanediol, Isododecane, Decyl Glucoside,Camellia Sinensis Leaf Extract, Aloe Barbadensis Leaf Juice, Coffea Arabica (Coffee) Leaf/Seed Extract, Morinda Citrifolia Fruit Extract, Garcinia Mangostana (Mangosteen) Fruit Extract, Euterpe Oleracea (Acai) Fruit Extract, Lycium Barbarum Fruit Extract, Punica Granatum Fruit Extract, Myrciaria Dubia (Camu Camu) Fruit Extract, Carya Ovata Bark Extract, Niacinamide, Sodium Chloride, Sodium Citrate, Phenoxyethanol.  Overnight repair, protection and hydration.  Moisturizing, nourishing, anti-aging, superior** antioxidant.  Promotes the synthesis of collagen in the skin and brighten skin tones. Directions - Apply 2-3 pearl sized drops to face and neck. Gently massage into skin using upward/inward strokes. Directions - Apply 2-3 ‘pearl size’ drops of serum to face and neck, concentrating around eye area and lips. Gently massage into skin. Follow with cream or moisturizer. Directions: Apply to freshly cleansed skin. Ensure the skin is dry. Apply to fingertips and massage into skin in a circular motion. Allow product to dry completely and then reapply a second time for total saturation. Ingredients: Purified Water (Aqua), Perfluorodecalin, Polyperfluoromethylisopropyl Ether, Isoceteth-20 (Polyoxyethylene 20 Isohexadecyl Ether),Phenoxyethanol, Ethylhexylglycerin.  Nourishes the skin and prevents loss of moisture through the use of rich and thick cream made up of butters, oils and Kakadu.  promotes skin rejuvenation and suppleness whose action have shown to reduce the appearance of fine lines and wrinkles. Directions: Remove all make-up and clean your face thoroughly. Apply to ring finger and tap gently over entire eye area. Ingredients: Purified Water (Aqua), White Oil, Cetearyl Alcohol, Cyclopentasiloxane, Dimethicone, Caprylic/Capric Triglyceride, Isopropyl Myristate, Carnitine, Caffeine, Ruscus Aculeatus Root Extract, Butylene Glycol, Chenopodium Quinoa Seed Extract, Squalane, Hyaluronic Acid, Polysorbate 60, Phenoxyethanol, Ethylhexylglycerin. Directions: Do not shake. Dip Q-tip into sediment at the bottom of bottle and dab onto affected area. This Macro-Salt Exfoliation treatment draws out impurities, helps even out skin tone, reduces scarring, rejuvenates the skin and promotes collagen growth. It is a perfect solution for all skin types! An ideal treatment to relax, restore, and refresh. After a cleansing to gently exfoliate the skin, the application of a custom blended mask immediately boosts radiance leaving your skin to look well rested. You will also see your complexion’s brightness restored! Walk out feeling relaxed and glowing! A popular basic facial to gently exfoliate clogged pores and nourish new skin. 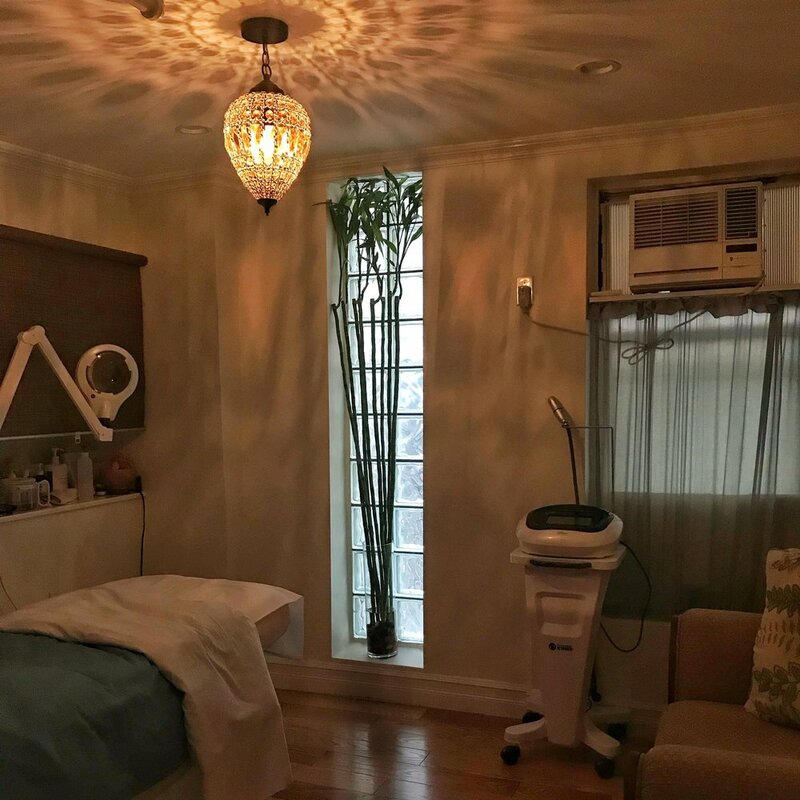 Feel like a glowgetter after this exceptional treatment! Our 24K gold sheet Macro-Fusion Ultrasound therapy indulges your skin and helps improve the appearance of evil fine lines and wrinkles. It also hydrates and brightens, stimulating cell repair and improving blood circulation. A unique Macro-Phototherapy treatment that naturally delivers unmatched skin renewal for all skin types. Clears dull and congested skin, promotes collagen production, reduces redness, inflammation, pigmentation, acne and post-acne discoloration. A skin-renewing treatment to deeply moisturize the skin. This is a non-invasive skin resurfacing facial that uses 435nm blue LED light aiding in detoxification and rejuvenation of the skin. Salicylic & glycolic acid loosens pore debris. Leaves your face immersed in a hydrating custom blended mask to soften and moisturize new skin. Recommended for oily, acne prone skin. A highly effective and quick treatment to firm the skin and reduce fine lines and wrinkles. It allows vital nutrients to deeply penetrate, hydrate and nourish the lower layers of the skin. Custom blended serums delivered using powerful ultrasonic waves leave your skin feeling nourished, renewed and invigorated. Skin is smoother and firmer. Catered to ALL skin types. A special treatment using a Multi-Wavelength Phototherapy LED module which effectively covers the entire face for even promotion of collagen production, reducing redness and inflammation and treating acne. Naturally delivers unmatched skin renewal for all skin types. Macro-Salt Exfoliation using a patented lightweight aluminum alloy handpiece to evenly exfoliate your skin and remove much more excess skin in a single treatment. Organic sea salt is used to draw out impurities, reduce scarring, and exfoliate the skin for a healthier, more even skin tone. Perfect for all skin types. The ultimate star treatment! A combination of our Macro-Rejuvenation, Organic Salt Detoxification, and Macro Fusion Firming Ultrasound treatments will leave your skin and you feeling Oscar worthy and ready to take on the world! Effective on all skin types. High intensity ultrasound therapy is a non surgical face lift to tighten and brighten skin texture. Touted by celebrities as a safe and effective procedure that can be used to improve facial wrinkles and skin laxity. It is most effective on the cheeks and jawline. Recommended for mature, aged skin. Thank you for choosing SkinSpoke! We hope you enjoyed our expertise and welcoming atmosphere during your visit. Please write a positive review on Yelp and also like us on Instagram & Twitter! As our way of saying thanks, you will receive 20% off your next facial of $180+. Sharing is caring! Tell a loved one! Refer your friends & family to SkinSpoke. When you refer a new client to SkinSpoke and they come in for any facials of $180+, you will get $100 off your next facial! They should mention your name so it will be recorded into our systems for your next visit. “The 24K gold sheet and ultrasound therapy helps remove the redness from the extraction… All of the redness went away after the 24K gold soft mask. The gold sheet also works as a facial detox… Carol says pollution is just one of the factors. Our hormones, what we eat, and products we apply to our skin all contribute as toxins. Remind me to detox more often! After the gold sheet, Carol covered my eyes to apply a custom 24K gold soft mask which includes caviar and a bit of vitamin C. This soft mask is great for firming, brightening, lifting and plumping the skin - all features I need help with now that we head to colder weather here in New York City. As a young girl growing up in Kuala Lampur, Carol dreamed of calling New York City home. She accomplished that dream at age 15. She focused on her true passion - helping women attain the most luminous skin possible. Now, with over 20 years of experience, Carol serves the beauty industry's most notable faces including top models, fashion designers, and editors from Vogue and Harper's Bazaar. Today, Carol is proud to announce the opening of her very own spa, SkinSpoke. Carol has shared her skin care views on Fox 5 TV and is among the most trusted facialists in NYC. Her clients depend on her for a personalized approach to their long-term skin care routine. 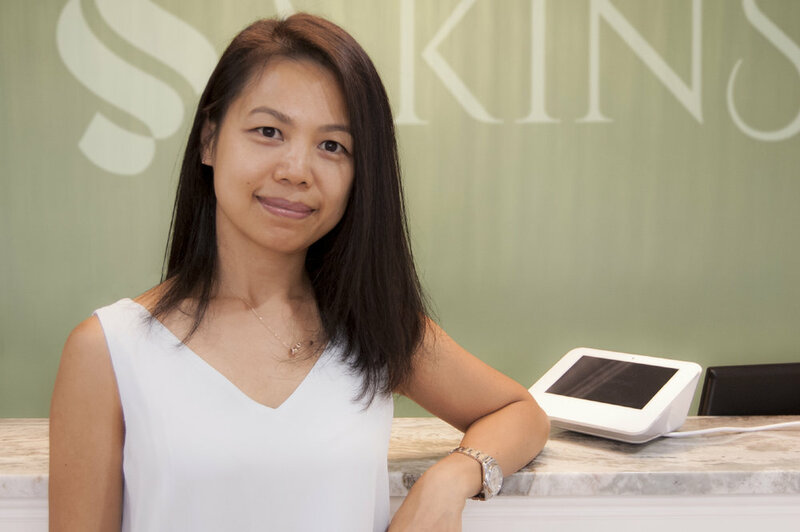 Carol has transformed the skin of countless women for their most important days, from brides to models needing restoration from a grueling work schedule or mothers' experiencing hormonal changes to their complexion. SkinSpoke embodies the culmination of Carol’s experience. As a sanctuary of beauty from the bustling city, SkinSpoke performs both innovative and classic beauty treatments. SkinSpoke also offers a selection of carefully researched and curated beauty products. Product Return Refund - In the event you may need to return any product, there is a 14-day return policy from the date of purchase. You must contact one of our customer service agents via email at care@skinspokenyc.com or come in directly to our store. If by mail, you must make your return to SkinSpoke LTD., Attention: Returns, 158 West 13th Street, NY, NY 10011, also please include in the package your name, contact number and your refund request number. Returned items must be in good condition and unused. Any returned items deemed not in good condition and used will be returned to sender and denied a refund or return. Items that have been returned for a refund to your original form of payment will be refunded (a "Return Refund") at the original purchase price plus applicable sales tax, the return shipping charges (if any) and a 20% restocking fee will be deducted from your refund. Please note that in connection with the Return Refund, a refund to your original form of payment includes restoring any prior Product Credit or referral credits that you may have used for your purchase to your SkinSpoke Ltd. account. Refunds to your original form of payment will appear on your statement within seven days. A copy of Skinspoke’s refund policy is available upon request. Return Credit - Items that have been returned for a SkinSpoke Ltd. product credit will be refunded in the form of a product credit (a "Product Credit") at the original purchase price, plus applicable sales tax. If applicable, the return shipping charges will be deducted from the amount of the Product Credit. Product Credit may be redeemed only for the purchase of product on the Site and may not be used for the purchase of gift cards or services. Product Credit is not transferable and may not be combined with Product Credit belonging to others. At no time may you purchase, sell or barter any Product Credit. Product Credit is not redeemable for cash, unless required by law. The obligations represented by outstanding Product Credit may at any time be assigned to and assumed by any affiliate of, or successor to, the present or any future owner of the SkinSpoke Ltd. website, or any third party under contract with such present or future owner. You, as a Member, expressly consent to and authorize any such future assignment and assumption of outstanding Product Credit obligations, and you agree to look solely to such assignee in the event of any such transfer. 24-Hour Cancellation Policy - Due to the high volume of appointment requests that our spa receives, we require a minimum 24 Hour notice to reschedule or cancel an appointment, we reserve the right to charge for the full service booked. If an appointment is made prior to 36 hours and there is an email on file, the system will automatically send you a reminder 36 hours prior to your appointment giving you the opportunity to contact us to confirm, reschedule or cancel your appointment. If you booked within a 24 hour period, it will be considered a confirmed appointment. Same day cancellations and missed appointments will result in a full charge for the appointment that was booked. SkinSpoke might call or email you as a courtesy reminder the day before your booked appointment. We request a credit card on file in order to reserve and hold your appropriate appointment time slot. Release and Waiver Liability - Expectations should be realistic and that you understand that results are not guaranteed. You fully understand that in skincare, there will be different results from different skin types. You understand that SkinSpoke Ltd will do the best to meet your expectation therefore you give permission to SkinSpoke Ltd. to perform any necessary facials, treatments or waxing and will hold SkinSpoke and her staff harmless from any liability that may have a negative reaction. You hereby voluntarily release, forever discharge, and agree that SkinSpoke LTD., its agents and employees shall not be liable to you for any injury or damage howsoever cause, resulting directly or indirectly from your participation in services offered by SkinSpoke including use of equipment, machines and products, including such claims which allege negligent acts of omissions of SkinSpoke. SkinSpoke is not responsible for your personal property or any lost or stolen items. All Policies, Terms and Conditions are subjected to change.